Search for the best flight prices from Stansted to Palma de Mallorca. Compare prices, book today and save money with Stansted Airport. Palma de Mallorca is a firm favourite for anyone looking to explore some of the most pristine and inviting beaches in Spain. With a healthy mix of local development alongside natural beauty, Mallorca is well established to offer travellers the best of both worlds. 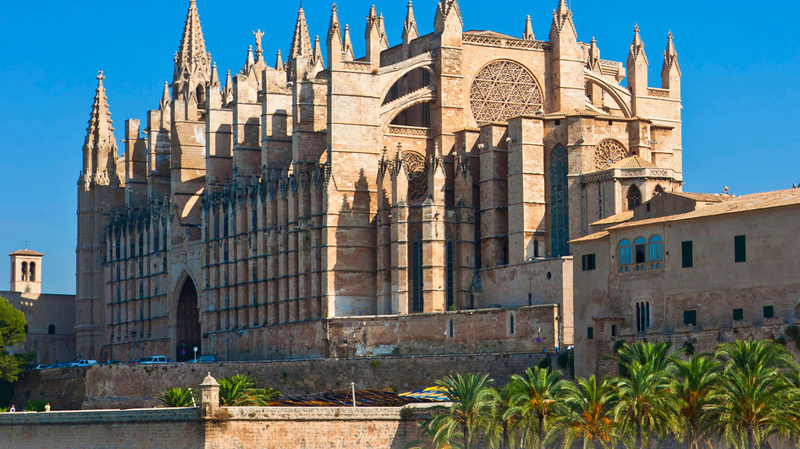 From the budget to the boutique, Palma de Mallorca has a host of fantastic accommodation. Gain a sense of traditional Majorcan chic at the Hotel Can Cera (Carrer San Francisco 8), a classy boutique escape in the Old Town. The classically styled Gran Mélia Victoria (Avinguda Joan Miró 21) is a good top-end option in the city centre. For a real ‘wow factor’, head 11km out of the city to Castillo Hotel Son Vida (Carrer Raixa 2). Set within a 13th-century estate, this opulent offering has obvious elegance and sweeping views of the bay. Those wishing to save their Euros need not miss out on historical charm, however, with a stay at character-filled former palace Hotel Born (Carrer Sant Jaume 3). Most shoppers head straight for Avinguda Jaume III, Palma’s main shopping street where international names jostle for attention. But the tree-lined Passeig des Born is also a good place for luxury boutiques. Brands can also be found at the Porto Pi Centro Comercial (Avinguda Gabriel Roca 54), a shopping centre 2km from the centre. For more unique items and traditional Majorcan design, wander around the Plaça Mayor district, which has a weekly market and a plethora of independent shops. Nearer the port, Rialto Living Lifestyle Store (Carrer de San Feliu 3) is a treasure trove of interior design and art. Foodies will delight at discovering Mercat Olivar, a buzzing food market on Plaça Olivar. Palma has a range of bars and restaurants to suit most tastes, whether simple tapas or cutting-edge cuisine. Café culture is big in Palma, with the atmospheric Bar Bosch (Plaça Rei Joan Carles I 6) a perfect place to try ensaïmada, a coil of light dough sprinkled with icing sugar. For more substantial fare, sit down to a meal at Café C’an Toni (Costa Santa Creu 5), a lively eatery serving traditional Majorcan dishes, such as succulent roast meats cooked in its wood-burning oven. Another mid-range option, Restaurant Toque (Carrer de Federico García Lorca 6), serves Belgian-influenced cuisine. Among the most fashionable restaurants is Simply Fosh (Carrer de la Missió 7a), a gourmet eatery in the Old Town.